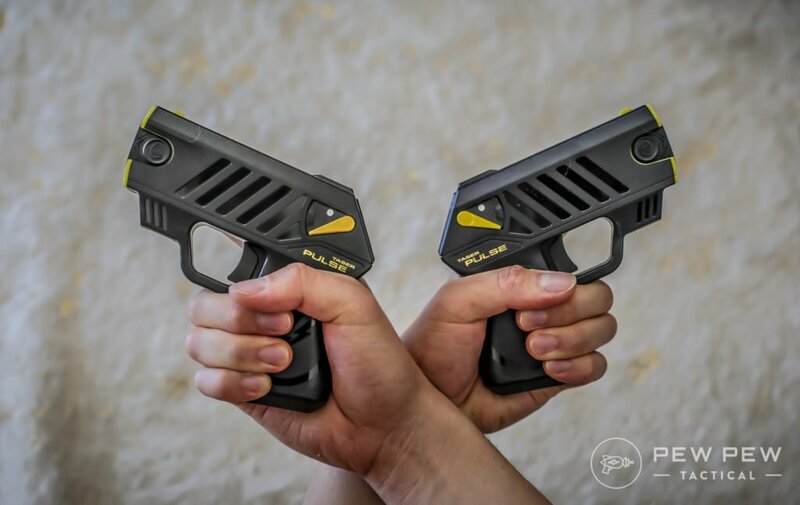 [Review] TASER Pulse: Best Civilian Less-Lethal Option? 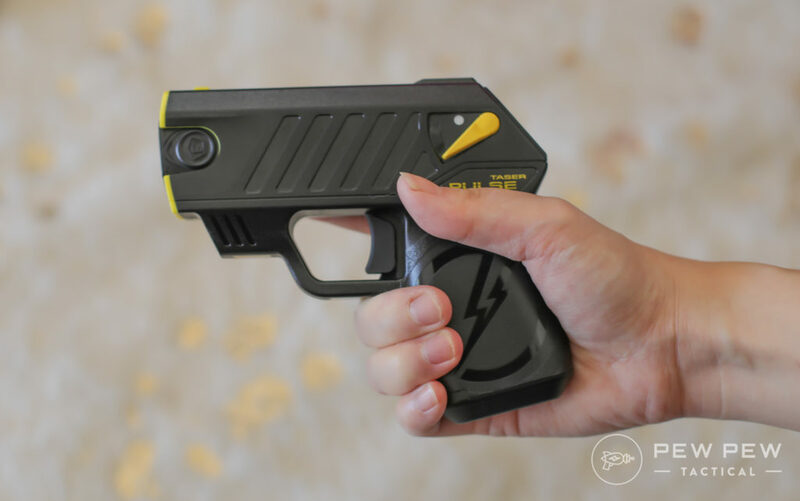 TASER…turning people into Wookie-sounding bags of jello since 1993. 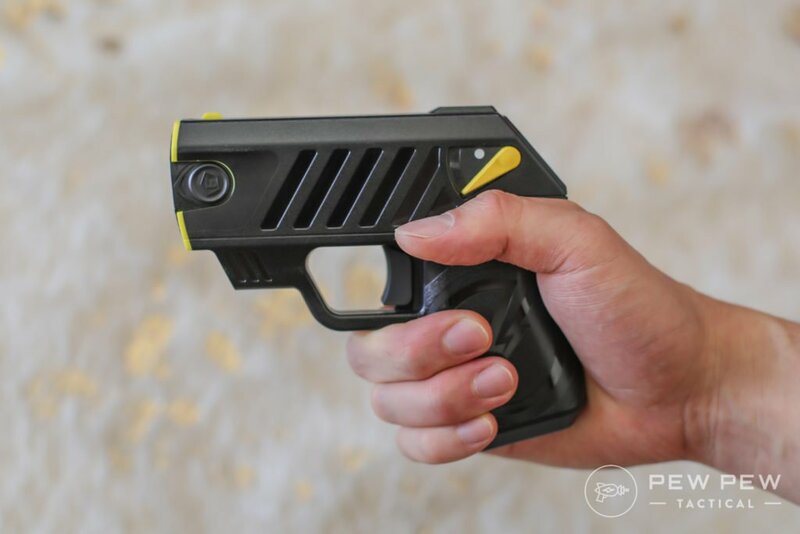 For a long time only available to law enforcement…the TASER Pulse is geared towards us normal civilian folks. I’ve been on-and-off carrying one for two years. 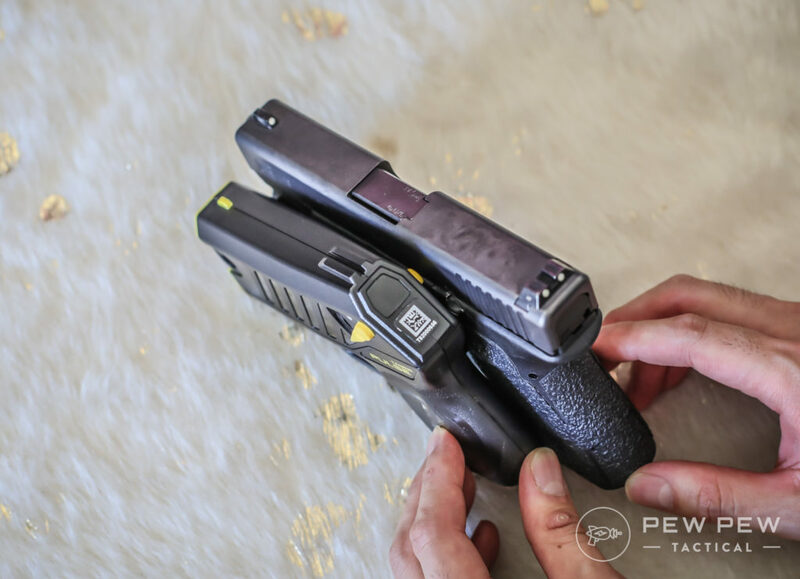 Find out what I think and whether the Pulse meets your less-lethal needs. Actual videos of me shooting it too! I’m sure you’ve seen the videos of it in action. This is the Pulse hooked up with clips and only for a few seconds (a full shot is 30 seconds that gives you time to run away). 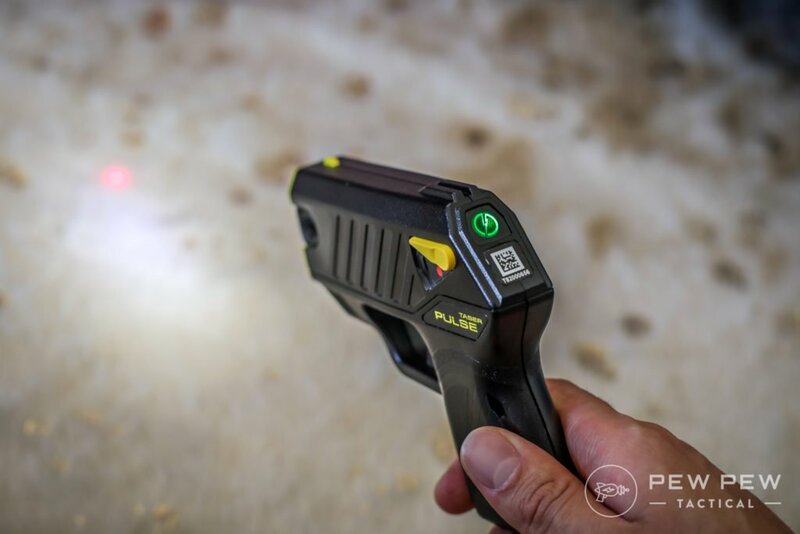 TASER has traditionally only gone after the law enforcement market…but the Pulse is now available to almost anyone with no licensing in most states. 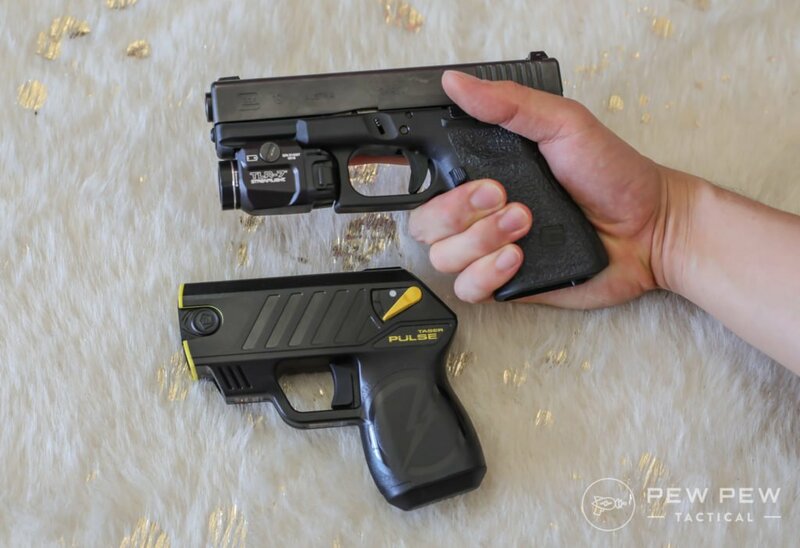 It’s shaped like a subcompact handgun, has a 15-foot range, a safety lever that activates a light and laser combo, and also a contact stun capability. TASER sent me this new unit for testing & photos, but the old one I bought myself when it was full price :-(. Replacement cartridges are roughly $70 for two. And batteries (that last around 2 years) are $23. It’s pretty light (8 oz) but feels quality for being completely polymer. For comparison…a Glock 19 is 29 oz loaded. Grip is also decent…I can get a full grip without a hanging pinkie. I’m a large SKD glove (Best ShootingGloves). And here is my wife’s grip (she’s a small SKD). As for size…here’s the Glock 19 again. And for the side profile. Sights are meh but low-profile and properly aligned with the laser at the 15 foot mark. My guess is if you’re using it you’re probably only using the laser. Lever to power on the unit is a flip-up that activates the laser/light and also a power indicator. Green for good and orange for time to change the battery. 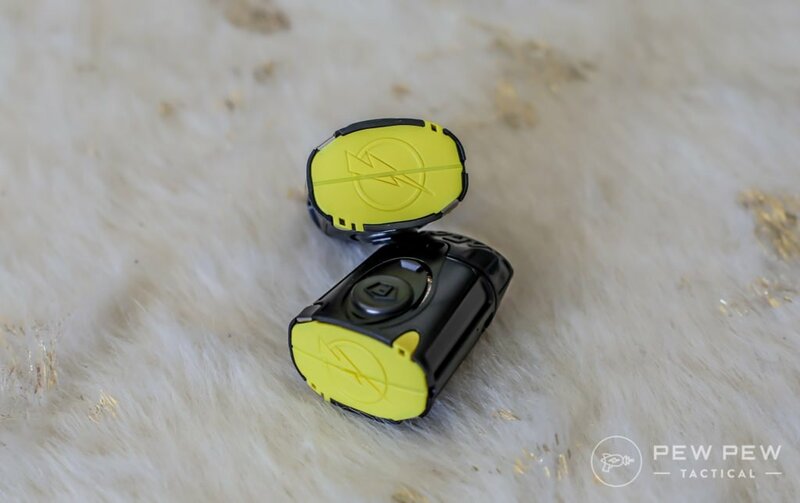 Batteries are in the grip and easily accessed when it’s time to change them. I’ve been testing it during the 2 years with a decent amount of contact stuns and I’m still in the green. Insert a cartridge (doesn’t matter orientation), make sure the battery is good, flip the lever up, and shoot. 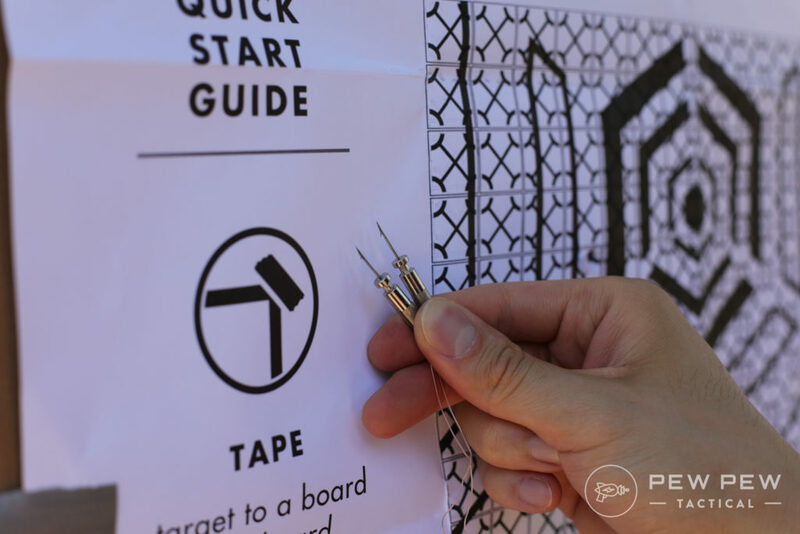 I put the conductive test target on some cardboard and loaded up one of my 2 year old cartridges. Once the two darts make contact, you’ll drive a 30 second charge of electricity into your target. That gives you time to get out of there. 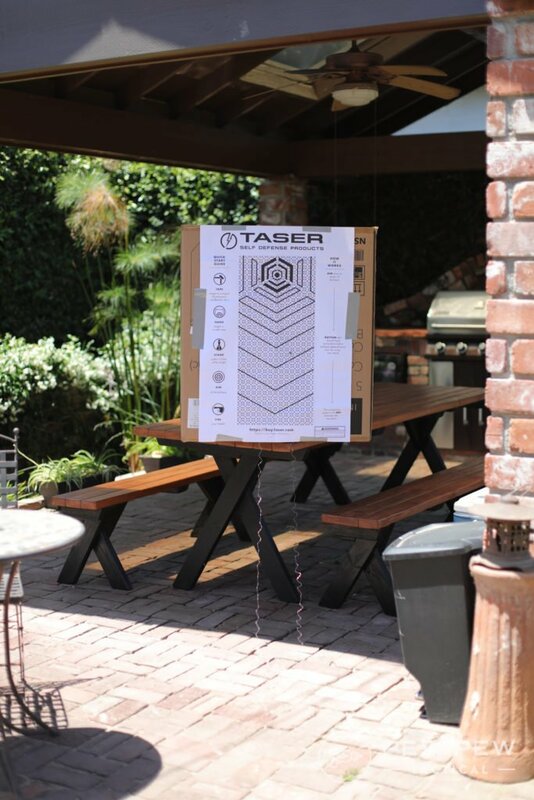 Check out the surges of electricity running across the target…and the difference in pulse patterns. The dart spread is also good for most adult torsos. And something really cool…there’s a Safe Escape Product Replacement Guarantee. 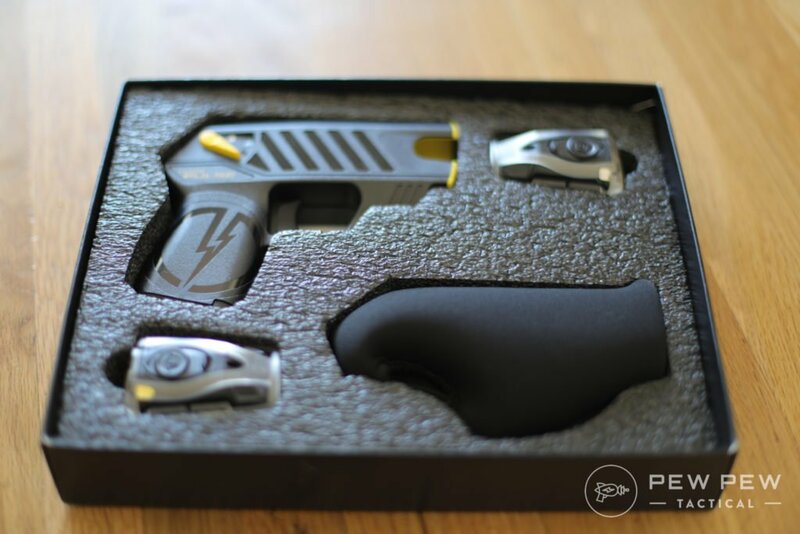 If there’s a police report that deems your use lawful self-defense…TASER will send you a new one! 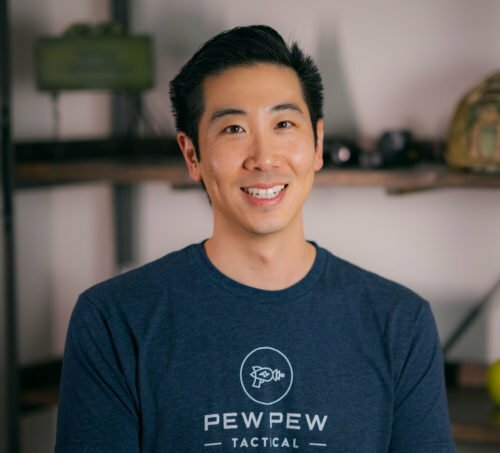 What if you miss…or you somehow need to incapacitate another target? You can either load up another cartridge (which probably isn’t going to happen), or you can take out the used cartridge and use the Pulse in contact stun mode. And the barbed electrodes…that’s gotta sting! Now I know whey they use alligator clips when testing them on law enforcement. And how what about the trigger? It’s comparable to a single-action trigger with no slack and a clean break…with the tactile feel of pressing down on the R or L button on a console controller. I measured it at an ultra-light 1 lb 10 oz. Chances are most bad things happen at night. I really like the integrated flashlight and laser underneath the main cartridge. Hopefully a laser on someone’s chest already defuses the situation. 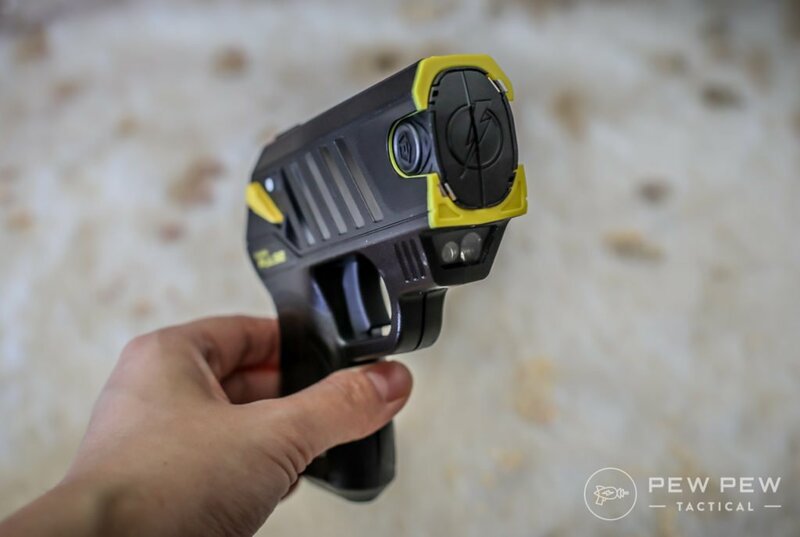 Besides the yellow outline on the front of the Pulse…it really looks like a subcompact gun. 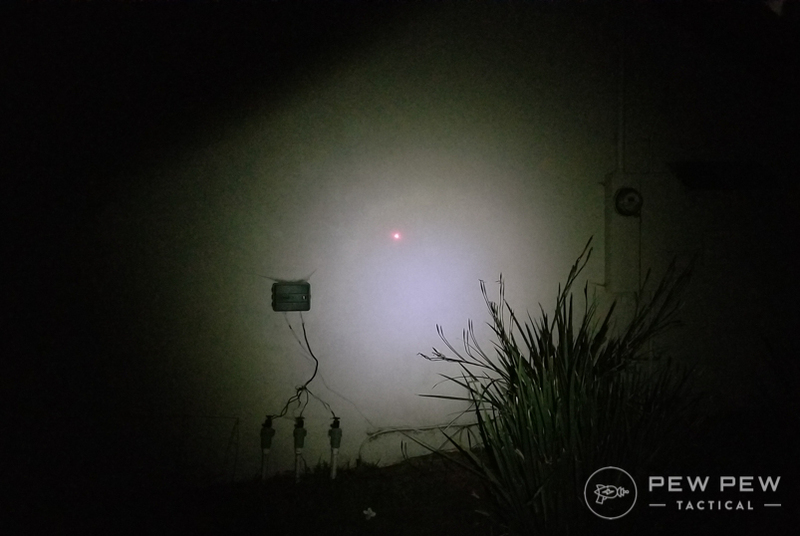 The light is decent…it’ll help you positively ID your target at around the 15 foot mark. 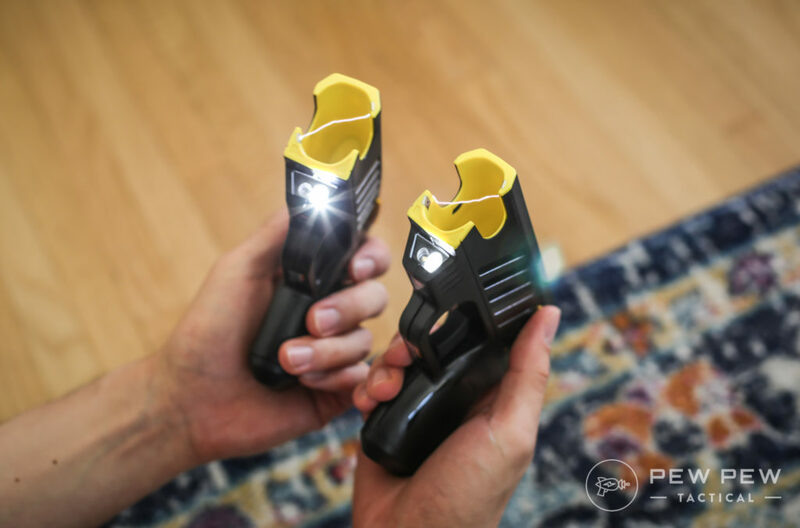 But it’s not exactly a great torch (5 Best Tactical Lights). 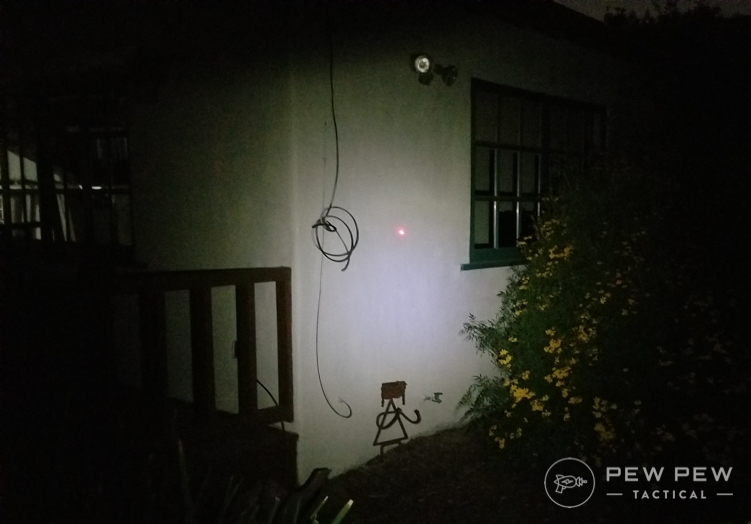 Laser is very visible at night and adequate during the day at 15 feet. And here’s the pattern indoors at around 8 feet…note that it’s rectangular in shape but once you’re out to 15 feet you won’t notice. The thing it comes with is really only meant as a cover. It’s soft and hard to take on and off. 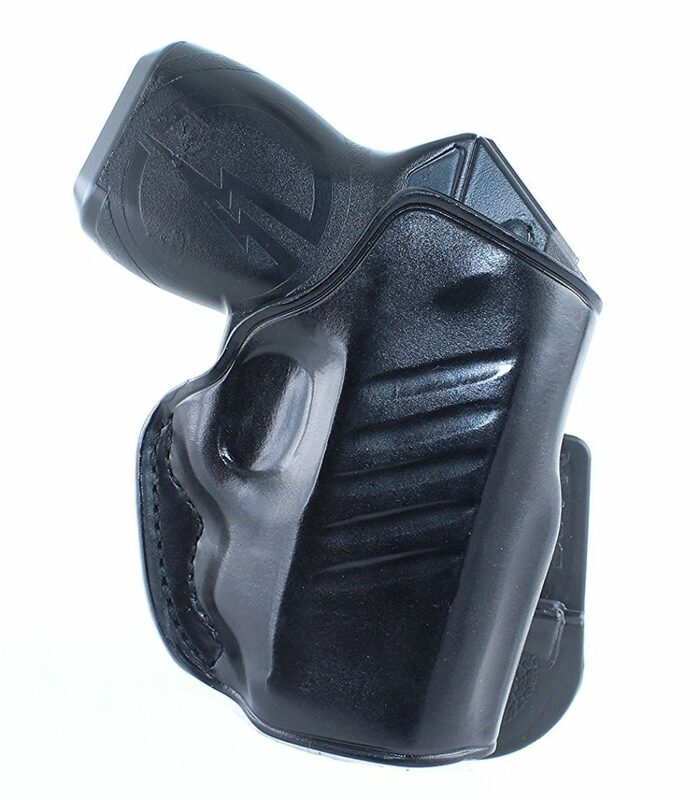 When I first got mine there weren’t a lot of options for holsters besides a nylon OWB (outside waistband) one from TASER ($21). 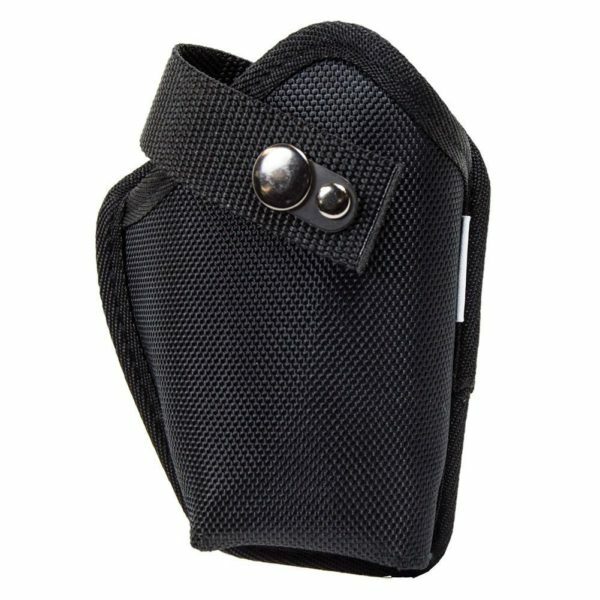 The one I’ve been using in appendix carry is this Kydex one with a clip. It’s pretty comfortable for walks and car rides. Conceals well, covers the trigger, doesn’t inadvertently activate the power lever, and is easy to draw. Other options include a Blade-Tech ($40) one with belt straps and screw holes for other methods. And even a leather paddle ($63) option. 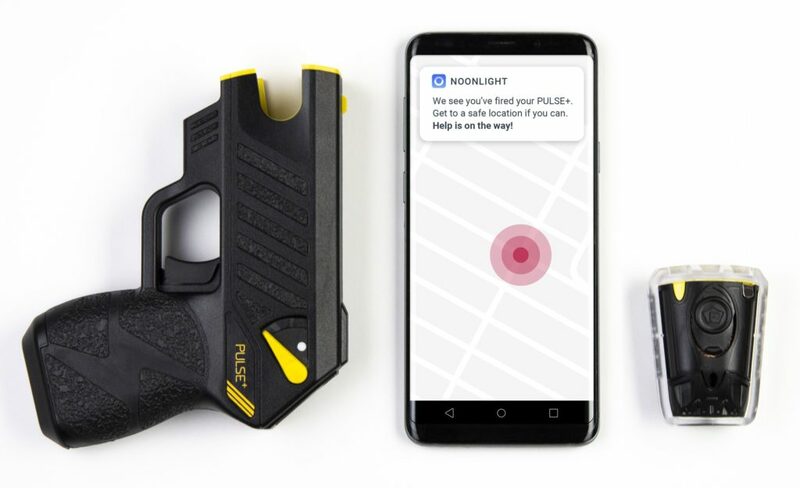 In November 2018, TASER announced a new model called the Pulse+ that automatically contacts emergency services and provides GPS location. 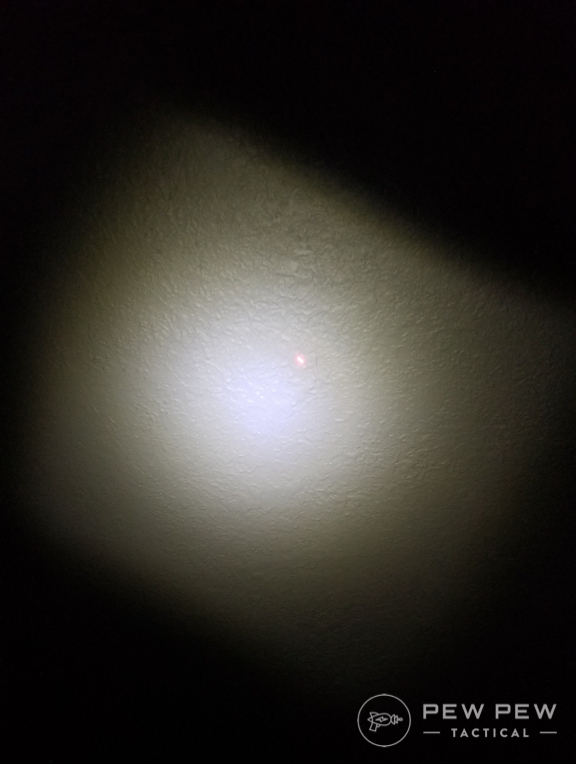 It’s able to do this by connecting via Bluetooth to the Noonlight app. 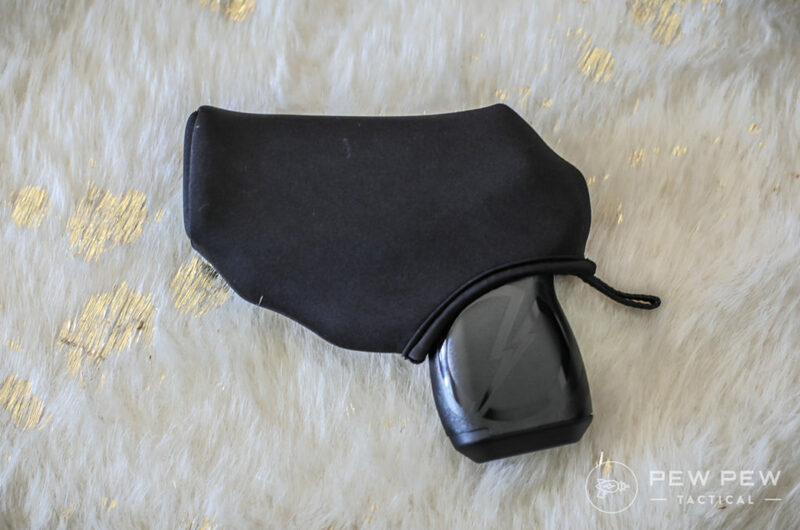 Now through January 1, 2019 you can trade in your regular Pulse for a $250 credit towards the Pulse+ which is listed at $449. 2 years and at least 20 usages of the contact stun to show my friends…my battery is still going strong. I haven’t shot dozens of cartridges but the one I did was fine. However, it does look like a handful of reviews on Amazon had less than reliable batteries. 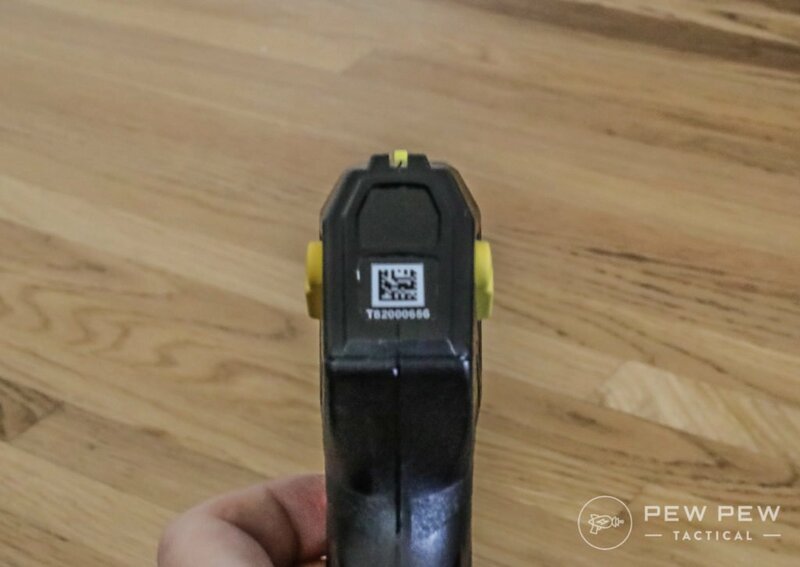 Within 15 feet if you keep the Pulse upright and on target with the laser…it will do its job. Nice subcompact size and grip that fits me fine and was rated as excellent by my wife. 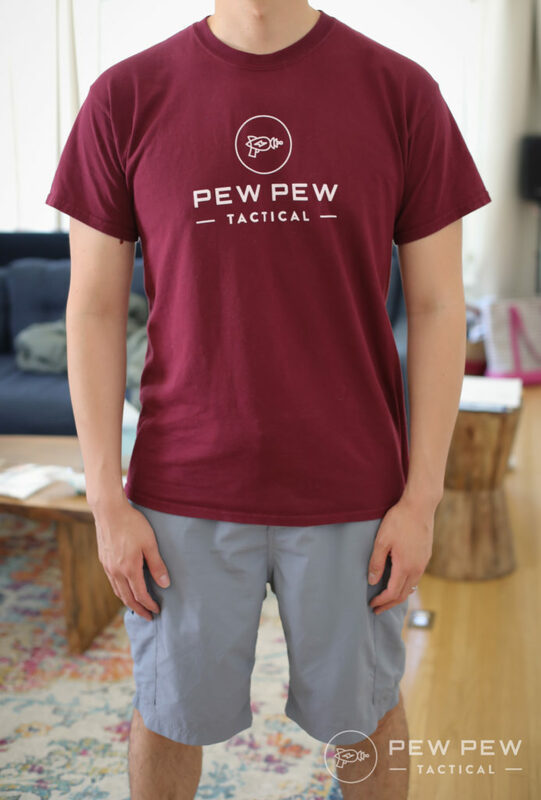 Looks like a subcompact gun…for better or for worse. 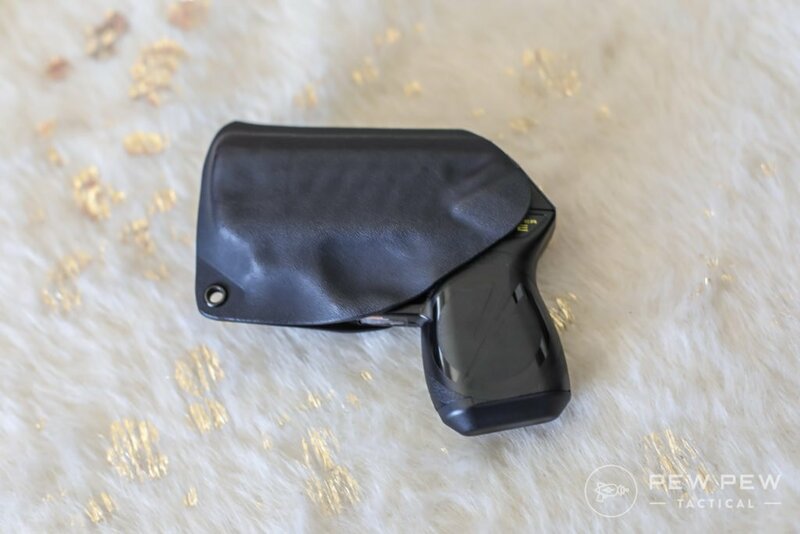 I guess you can choose a holster? 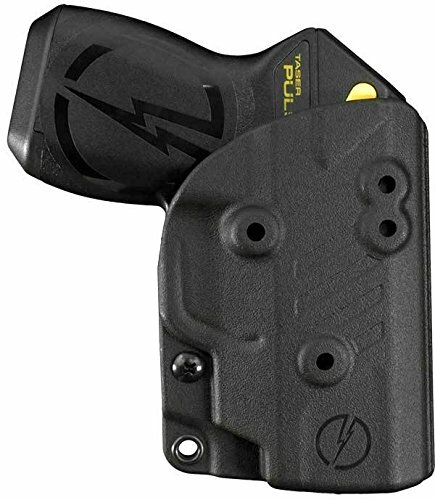 But customization isn’t really the name of the game for a TASER device. Decently priced for what you get at $279. Cartridges are $35 each and remember to change batteries every 2 years at $23 a pop. 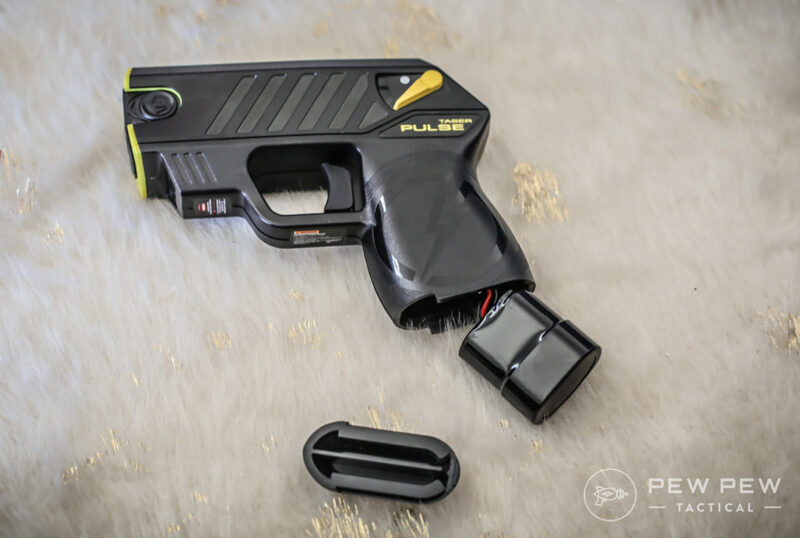 If you’re looking for a less-lethal option that doesn’t require you get up close and personal like pepper spray or stun guns…try out the TASER Pulse. 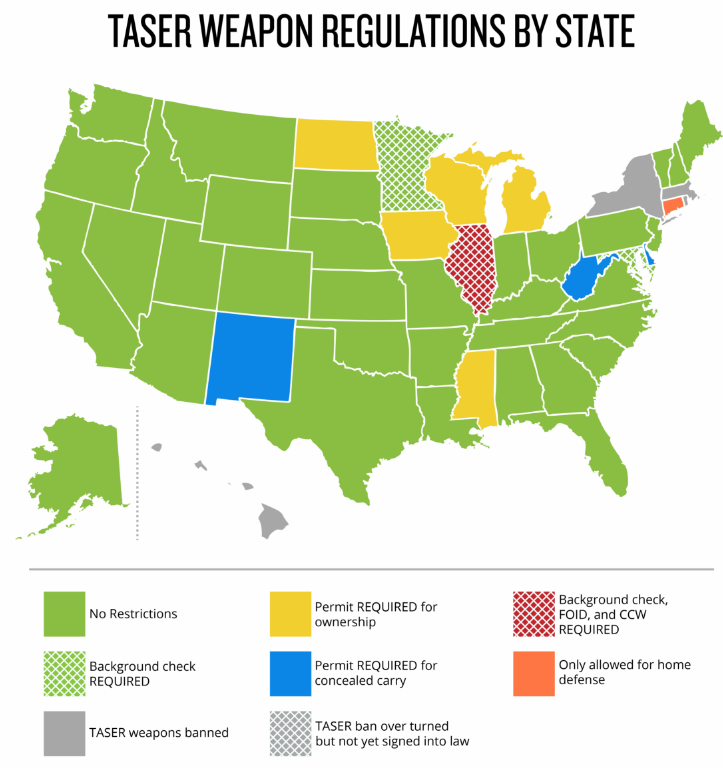 Or if you’re in a CCW unfriendly state but you still want protection previously only available to law enforcement. It’s decently priced now, is light, ergonomic, and is pretty easy to hit the target. Plus the contact stun is a plus if you miss. Extra cartridges and keeping the battery fed is a little annoying but not enough to deter my personal use. I’m going to continue to carry mine and the second one is going into my wife’s purse. 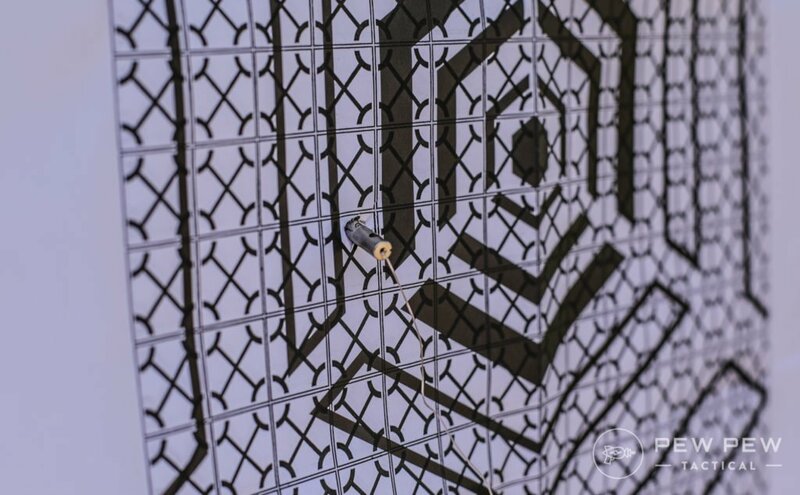 What’s your opinion of the Pulse…or did you go with some other sort of less-lethal option? Or is it best to carry some real steel? 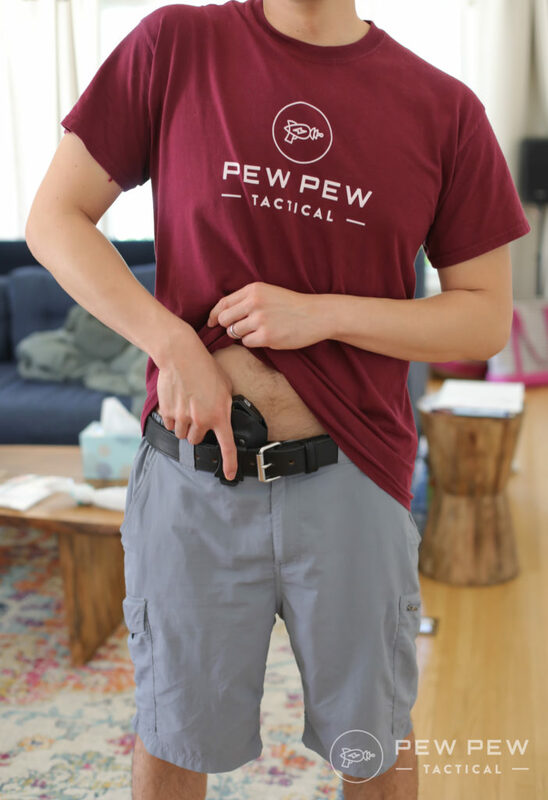 Make sure you don’t have an AD with appendix carry. Yes the “old” model is still available.